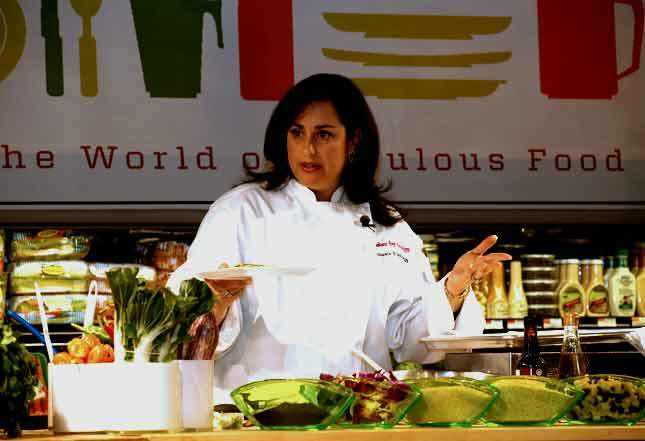 Pomegranate Supermarket has been running a cooking demo series called Cooking with Class. Their guest Chef, this past Monday, was award winning cookbook author Susie Fishbein. In a friendly and entertaining manner, she demonstrated three fish dishes. She explained how to ensure that the fish, whether filleted or whole, is absolutely fresh as that would guarantee a non fish smelling or fish tasting dish. After each dish was done (and all three were done in minutes! ), samples were given out for the audience to savor. Those of you who have been following these pages for a while, know that I’m not a fish fan (until just over a year ago I’d always refused to get near a fish dish). On Monday, like the rest of the audience, I savored these delicious finned creatures… because they neither smelled nor tasted fishy! Now, get ready to taste it! Of the dishes demonstrated, my favorite was the second one and Mrs. Fishbein graciously agreed to share the recipe. This dish is an authentic Cajun, mouth-on-fire delicacy. Blackened refers to the spices, not the lack of cooking prowess. If you are worried about the heat, only coat one side of the fish with the spice mixture, although it will still be hot. I like to make a batch of the spices and keep them in a baby food jar so that dinner preparation on this dish (it’s also great on thinly pounded chicken breast) is a snap. If you have a cast iron skillet, it is the way to go. If not, use a nonstick frying pan and get it very hot as well. Warn your guests, pour a big pitcher of ice water and enjoy! Spray a large frying pan or well-seasoned cast iron skillet with nonstick cooking spray. In a flat plate combine the onion powder, garlic powder, cayenne, white pepper, paprika, thyme, oregano and basil. Mix well. Dredge each fillet in the melted butter, then coat with the spice mixture in one or both sides. reserve the melted butter. If using a cast-iron skillet, get it very hot. If not, heat the frying pan over medium -high heat until very hot but not smoking. Carefully place the fillets in the skillet and sear about 3-5 minutes or until blackened. Pour 1 tablespoon of reserved melted butter on each fillet. Flip the fish over and pour 1 tablespoon of of melted butter over each fillet and blacken the other side, about 2-3 minutes. If you only spiced one side the second side won’t get black, just cook the fish through until it’s done. Remove fish to dinner plates. Brush the tomato halves with the melted butter and sprinkle with oregano. sear the tomatoes in the frying pan about 3 minutes or until soft. Flip the other side and cook 1-2 minutes longer. 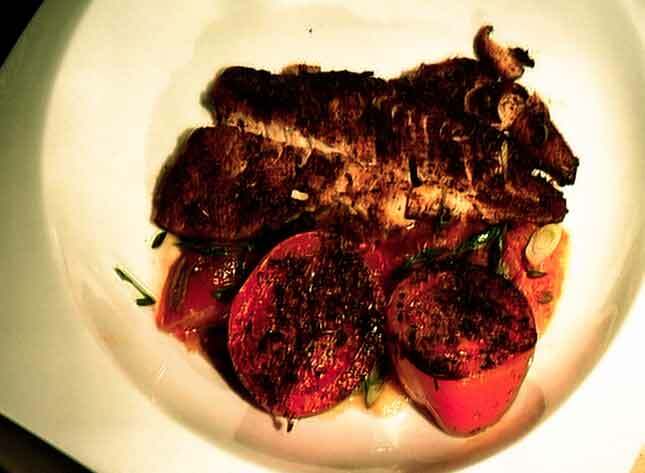 Serve each fillet with a big dollop of sour cream and two tomato halves. 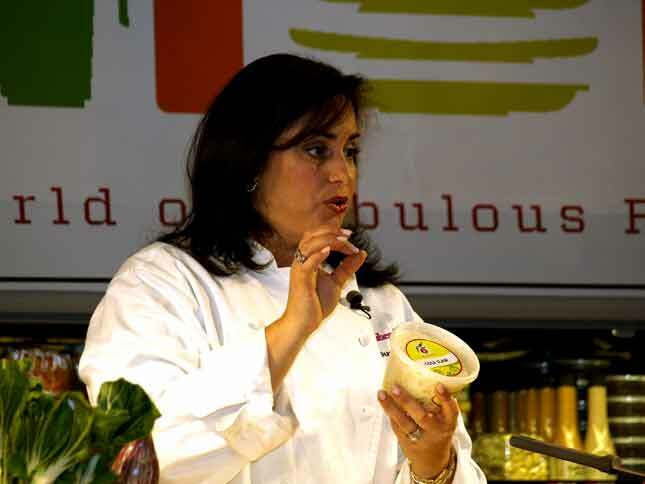 Mrs. Fishbein will be back at Pomegranate on Tuesday, March 8, to demonstrate how to cook Grouper and Mahi Mahi and again on Monday, March 14 to demo her techniques for Halibut. Can’t wait to learn from her! Even when I lived outside of the US, whether in Uruguay, Israel, etc., I’d hear about Southern cooking. When I first came to the States in 1962 and moved to Richmond, VA (the capital of the Confederacy), I actually got to taste a few superb kosher variations on the Southern theme. Recently, I came across Simply Southern – With a Dash of Kosher Soul, a cookbook published by the Margolin Hebrew Academy/Feinstone Yeshiva of the South of Memphis, TN. I couldn’t wait to try out some of the book’s delicacies, I wasn’t disappointed! The recipes are a easy to make, short-cutting more complex directions with readily available ingredients that make preparation a snap. This ain’t no diet cookbook, so if you’ve been watching your waist after yom tov feasting save this for the times when you want to cook quick tasty dishes with that special touch of true Americana. The recipes are clear, the assortment fun, pretty to look at and absolutely delicious. True Southerners make enough for leftovers. Nothing beats cold fried chicken for lunch the day after. Do not skip the salt! salt is an especially important ingredient to the authentic taste of this signature dish of Dixie! Whisk together water, salt, cayenne, garlic powder, white pepper, soy sauce, and Worcestershire sauce. Add chicken pieces to marinade. Toss to coat. Cover and refrigerate for 24 hours. Heat oil in a deep fryer to 360-375 degrees. Drain marinade from chicken on paper towels and pat dry. Sprinkle chicken on both sides with self-rising flour. Blend eggs and water. Combine all-purpose flour, salt, garlic powder, cayenne and white pepper. Dip chicken in egg wash. Dredge in flour mixture. Place chicken on a large baking sheet. Let sand for 10 minutes. Fry chicken in hot oil turning a few times for 20-25 minutes or until golden browned. Drain on a rack over paper towels. For dessert I loved the Chess Pie, I also liked the humor in the intro to this dish. Chess pie is one of the South’s great contributions to the culinary arts. One folk story asserts that it was originally called “just pie,” which was drawled as “jus’ pie,” eventually rolling off the tongue as “chess pie.” This is always a favorite! Preheat oven to 350 degrees. Combine sugar, cocoa, and margarine in a bowl. Add eggs and beat until smooth. Blend in soymilk, vanilla and salt. Pour filling into pie shell. Bake at 350 degrees for 45 minutes until tester comes out clean. Cool top with whipped topping. Pie freezes well. Drizzle chocolate syrup across the top! Each section starts out with a few short paragraphs detailing the transition of Southern cooking into Kosher cooking or an occasional anecdote to bring the Memphis community a little closer to wherever you are. Liberally sprinkled with humor and folksy story tellin’ Simply Southern – With a Dash of Kosher Soul is sure to change your view of classic American cooking. Enjoy it, gentle reader, enjoy it in all its finger lickin’ goodness! I adore these soft sweet pears and the way the sweet potatoes become sticky and sweet. You can try this with cubed butternut squash in addition to or in place of the sweet potatoes. While you have the maple syrup on hand, put the Pineapple Maple Glazed Salmon (page 134) on your menu for another night. For easy cleanup, completely cover a jelly roll pan with aluminum foil. Set aside. syrup and salt. Cook until it starts to bubble. Remove from heat. Pour over the pears and sweet potatoes. Toss to coat. Bake, uncovered, for 11⁄2 hours. Transfer to a serving bowl or platter. …and one more, can’t wait to try it! Pour over the salmon and bake, uncovered, for 15 minutes. Comfort food is what it’s all about! What is comfort food, you ask? It’s fun food, heart-warming food, food that brings memories of warmth, memories of times past. Interestingly enough most comfort food stems from poverty. Creations relying on inexpensive cuts of meat/fish, and the cheapest ingredients available. There are countless examples: American Soul food,Mac&Cheese, Meatloaf, Rice & Refried beans (also Latin Americas’ protein supplement), Hummus & Fava Beans (the North African protein supplement), Pasta,etc. Every country has its own array of comfort food, Fish N’ Chips are The British Empires’ greatest contribution to the culinary world! Well… that may be debatable, but it’s definitely the food for which English cuisine is most famous. It became popular in South-East England and London in the early 1800’s. They were even referenced in Charles Dickens’, “Oliver Twist” (published 1838). The first recorded Fish N’ Chip shop was opened between 1860-1865 by one Joseph Malin in London. Selling for Nine Pence in the 1800’s, it soon became the quintessential poor man’s food. Trawling (pulling nets through the water behind the ship), which became the main fishing method in 19th century England, made fish abundant and thus inexpensive. Along with the fact that potatoes could be farmed on almost any soil and could survive the British Isles’ harsh winter, fish and potatoes became the perfect choice for the hungry working class. Fish N’ Chips shops and carts are still the main British working stiff’s lunch or traditional Friday night dinner. 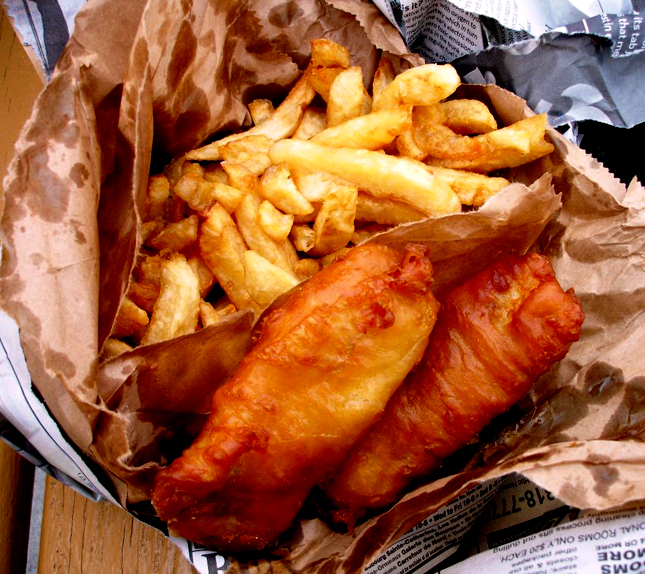 Traditionally served wrapped in newspaper, the fish is beer battered and deep fried with the fries. It is then drizzled with malt vinegar or onion vinegar (the vinegar used for pickling onions). Classically a Cod family fish is used (Cod, Haddock, Pollock, Hake), these are lean white flesh fish that are found in great numbers in the Atlantic Ocean. Sprinkle yeast over the warm water and let stand until fully dissolved. Mix flour, salt and sugar and make a well in the center. Add the yeast mixture, oil and beer and stir to combine only. Gently fold in the egg whites. Let stand for 1/2 hour until the batter becomes frothy. Pat the fish fillets and season. Heat frying oil to 350 degrees F. Drain well and fry potatoes, only to cook through – no color! Fry in batches! Set aside. Reheat the oil to 400 degrees F (the cold batter will make the oil temp drop initially). Dip the fish in the batter and fry. Add the fries for the last 2 minutes to color and crisp up. Toss the fries in a mixing bowl with salt. Serve with malt vinegar and lemon wedges . Chef David Kolotkin, from Prime Grill, has appeared on this pages before ( here, here, here, and here); now he’s back to give us one his superb recipes. As you already know, Chef David doesn’t do things the traditional heimische way but… the result are incredibly delicious! 1. In a food processor with the blade attatchment, process onions until fine and minced. Place in a large mixing bowl. 2. Place carrots and celery in the food processor and repeat step #1. Place with onions in the bowl. 3. Add herbs to the vegetables. 4. Process Sea Bass until fine. Add the eggs, sugar, salt and pepper and mix until combined. Add this to the bowl with the vegetables and herbs. Mix well with a spoon. 5. Using a spoon, make 2-3oz quenelles and place on a cookie sheet lined with wax paper. 6. Bake for 12-15 minutes until tender and firm. Cool and reserve. We will use the smoked salmon during the assembly of this dish so keep it refrigerated for later. 1. Combine sugar, vinegar and water in a deep pot. 2. Add the beets to the pot and bring to a simmer uncovered until beets are tender. Approx 45 minutes and until only a little liquid is left. The remaining liquid should be a syrup. -2 tbsp prepared white horseradish, liquid squeezed out. 1. Place all ingredients except the oil into a mixing bowl. 2. Combine using a flexible whisk. 3. Slowly start to drizzle the oil in while whisking vigorously in a slow steady stream. Whisk until all the oil has been emulsified. This entire aioli can also be done in a food processor. 1. Place a small dollop of the aioli on a pc of the chilean sea bass mousse. 2. Depending on the size of the smoked salmon slices you may need 1-2 pcs per mousse. Lays the salmon flat on a cutting board. Place the Chilean bass mousse ontop, and roll so the smoked salmon wraps evenly around. Repeat this process until done. 3. Place 1 -2 pcs of the Chilean Sea Bass Mousse, Wrapped with Smoked Salmon, on a plate with the sweet and sour beets next to them. It is nice to drizzle some of the natural beet syrup on the plate. Extra horseradish lemon aioli can be placed on the plate as well.